When it comes to disasters and emergencies, communication can be key to survival. One miscommunication, misunderstood word, or misspoken letter can cause the situation to spiral out of control. Words and letters that sound the same can easily be mixed up in loud, chaotic, or stressful situations. We have all been frustrated trying to talk in a loud environment- just imagine this frustration if you now that life is on the line. A single misunderstanding can be life altering or worse- fatal. Knowing, understanding, and using the military and NATO adopted phonetic alphabet can prevent these misunderstandings. 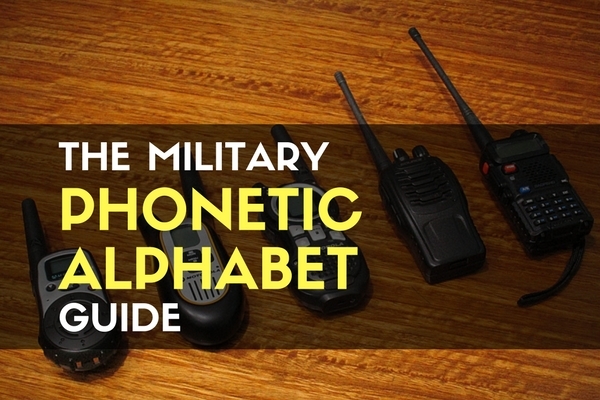 The military, along with law enforcement and first responders all use the phonetic alphabet to convey information in loud, chaotic settings or over radio communications. Knowing these can help you stay informed or even add important information to the conversation. The military phonetic alphabet can even be helpful in conveying every day information- just so you don’t have to repeat yourself. We will first run through the military phonetic alphabet below, and then take a look at why those words are used, and when to use them. You probably recognize many of these as company names from the greatest generation’s war. Some of the words did not change, but most of them did when the US collaborated with Britain on the current phonetic alphabet at the end of the war. They carried this phonetic alphabet over when they established NATO. Alpha – Delta – Used as FPCON (Force Protection Condition) threat levels. Normal is also a level. Some of these even add syllables, which make them take longer to say. But for those that know the alphabet and these common phrases, they are hard to miss over radios. Of course, the military phonetic alphabet is also used for map grid coordinates and land navigation. The last one is the most drastic pronunciation change. Adding the “r” to the end of “nine” allows it to be less confused with plenty of other words. The importance of communication has been known since the dawn of man. Hand signals, facial expressions, and spoken language are all tools that have helped us to survive through the trials we have faced. Misunderstanding or communicating the wrong message could have disastrous consequences in a survival situation. Let us know in the comments any stories you may have where communication cost you big. Survival is a deadly game of inches, and being informed gives us the edge we need. Keep exploring, stay prepared, and be safe. Same here. Just wasted 15 trying figure out when it changed from my boot camp days. Thanks for letting us know. Probably an autocorrect mishap or typo. Golf hasn’t gone anywhere!